Former New York Gov. 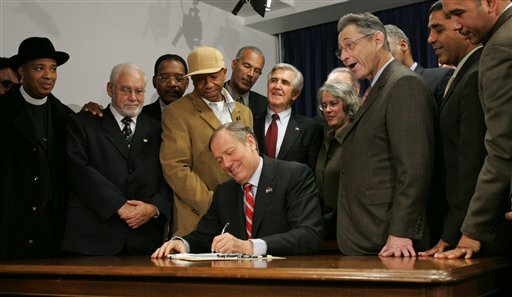 George Pataki signs Rockefeller law reforms in 2004. An editorial in the New York Times notes that the New York Legislature finally seems poised to overturn the infamous Rockefeller drug laws. The impending change comes too late for the tens of thousands of low-level, nonviolent drug offenders who wasted away in prison because of mandatory sentencing policies when they should have been given treatment and leniency. But after years of building support for reform, legislative leaders now have it within their power to make wholesale changes in this profoundly destructive law.